NMDC Limited Director (Commercial) Recruitment 2018 – First of all, Smt Kimbuong Kipgen, Secretary, Public Enterprises Selection Board, Public Enterprises Bhawan, Block Number. 14, CGO Complex, Lodhi Road, New Delhi – 110003 is the address where Application Forms need to be sent to. Besides, the four most important details i.e. Rs. 75000 – Rs. 1,00,000 as the scale of the post, Schedule A as the schedule of the CPSE, 1 June 2019 as the date of Vacancy, Director (Commercial) as the name of the post, NMDC limited as the Name of the CPSE, Government of India, Department of Personnel & Training (Public Enterprises Selection Board) has released a latest Job Vacancy Official Recruitment Notification Online in PDF format on 12th September 2018. If you’ve done Master in Business Administration or MBA/ PGDM then you’ll hold more chances of selection and will have an added advantage. While as a part of basic educational qualifications, the applicant needs to be a graduate from a recognized university/ Institute of India. Mainly in Minerals and metals sector, the applicant needs to have an experience of two years of cumulative marketing/ material management in the last ten years. 26th October 2018 is the last date and time by why the applicant should have been posted in that day is 1500 hrs. Based upon educational qualifications and experience, Office and Board of Controller of Recruitment will shortlist or select the candidates who will have to further appear for the interview procedure. Candidates can go with one out of following methods. 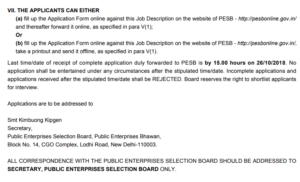 Filling up the Online Application Form against this job description on the website of PESB is www.pesbonline.gov.in is common in both the methods. But thereafter, a candidate can either forward it online as specified in Para V of authentic notification PDF or can take a printout and send it offline.